Hiroshima (132.468E 34.359N) was founded in 1594 on the delta of the Ota River. The city sits on six islands connected by numerous bridges. It is an important manufacturing center and the communications hub of a significant agricultural region. The population in 1940 was 344,000 persons. Hiroshima was an important port and major military center in 1941. It was headquarters for 59 Army, and nearby was Kizarasu Airfield. By August 1945, Hiroshima was the headquarters of 2 General Army and the military population stood at about 43,000 soldiers. The city had been spared from fire bombing prior to 3 July 1945, largely because it had almost no aircraft industry. On that date, the Joint Chiefs of Staff ordered that there be no conventional air attack on the city, which had been identified as a target for nuclear attack. 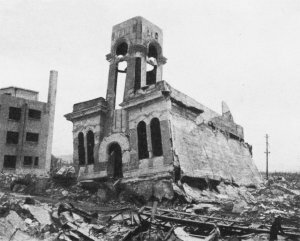 The immediate death toll of the Hiroshima attack was about 80,000, and additional delayed deaths from radiation sickness are thought to have pushed the death toll well above 100,000.